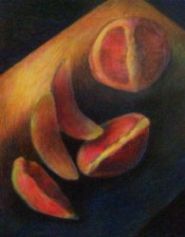 Click here to read my ezine article on "Sensual and Artful Colored Pencils"
Click on the ezine logo below to read all of my articles! Here are great video lessons I have created for anyone wanting to explore drawing with colored pencils. You will enjoy doing any of these video lessons, although some of the lessons require some drawing skills. Watch the videos to see if you want to grow or augment your drawing skills first. If you do, just click below on the link to learning about drawing. Want to learn more about drawing? The video lessons offered are the following: "Colored Pencil Shading Exercise," "Draw A Leaf With Colored Pencils," "Color Layering," "Draw A Vase," "Draw A Vase of Flowers," "Draw A Flower," "Oil Pastel and Colored Pencil Technique,""How I Draw With Colored Pencils," "Water Color and Colored Pencil Fish Technique," and "Cornbread Still Life Colored Pencil Drawing," "A Coloring Book Page--Create Your Own." Discover many ways of drawing with colored pencils through my videos lessons--and enjoy! Click here to start your FREE Drawing With Colored Pencils lessons. I am in Johannesburg, South Africa. (Where Soccer Fever is more important than art at the moment - our country is rocking and roaring with soccer and overseas visitors.) I am a parttime artist always browsing for ways to improve my painting. I actually do conceptual art and is already an advanced artist. I am always interested in the ways other people approach technique. Thank you for the drawing with pencil and oil pastel video instruction. I live in Maryland and I was in a bind because my son's art teacher became ill in the last two weeks of class for the summer. I home school, so I googled free art classes on-line and found your website. We will be working on these lessons this week. They are having a great time with the doodling with pastels exercise. We plan on visiting some art museums next week to round out their introduction art experience.